The geologic center for the Los Angeles Basin is the place where the Los Angeles River and the river known as Rio Hondo merge in South Gate. At this central point, sand, silt, clay and other river sediments are the deepest. Actually in excess of 30,000 feet of sediment separate the surface here from the bedrock below. This is the height of the highest mountains in the Himalayas! Surrounding this enormous bowl of sand are mountains, namely the San Gabriel Mountains, the Santa Monica Mountains, the Santa Ana Mountains and the Palos Verdes Peninsula. Just like today’s Santa Catalina Island, the P.V. peninsula was once an island offshore. Geology can only be studied on vast time scales. Today’s Los Angeles Basin was once underwater. Fifteen million years ago a shallow sea covered today’s L.A. The mountains surrounding it, which are still here, were slowly spiraling around the sea as the Pacific tectonic plate ground it’s way Northward past the North American plate. As the mountains slowly circled the sea, the Earth’s crust below twisted, stretched and cracked enough to allow molten lava to reach the surface. This newer crust began collapsing as it stretched thin, and eventually it formed a deep bowl of rock, above which sediments from not only the local rivers of the time, but also the sea itself, began to gradually give us our giant bowl of sand. Small microorganisms also poured in and as they lived, died and settled in vast numbers, they slowly began to change under pressure to become today’s oil and gas deposits. About 5 million years ago, the stretching of the crust stopped. As the bowl shrank, it continued to be filled with sediment and at the same same time, seismic activity started raising the level of the ground. 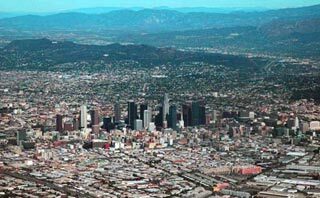 The former ocean floor became the future backyards of the San Fernando Valley and Beverly Hills etc. As the sea floor became dry land, rivers such as today’s Los Angeles, Rio Honda, Ballona Creek, and countless others which are no longer visible from the city’s surface, meandered and flooded and cut and diverted and merged and separated over and over again. It is this sediment that we call our ground today. There are fossils of sea creatures in the soil of our backyards. There are winding boulevards built over old rivers and streams, and when the earthquakes come, the sandy bowl always throws us surprises, with one block shaking itself to pieces right beside another block that barely moves. It is this giant wobbly sandpit that contains our skyscraper foundations, our subways, and our utilities infrastructure. It is upon this sediment that we build our million dollar wood framed houses. In geologic time, it is but a moment since the first human set foot in the basin, and it will be just another moment before all traces of our stay here will have been buried or washed away. And eventually, the continental plate upon which we rest, will be subducted and recycled in the magma. And as if that wasn’t enough, the Sun will one day swell to take back the Earth, then long after that, will die itself and our atoms will potentially spark a new life somewhere else in the unimaginably long distant future. Jeffrey the Barak has lived in L.A. for more than twenty years. It has hardly moved during this time. Nice one, easy to read and understand..keep stories rolling. I visited L A a while ago in 1978, and surely will never forget my experience. What an amazingly informative article!